Always wanted to learn to sew your own coat but nervous to go it alone? 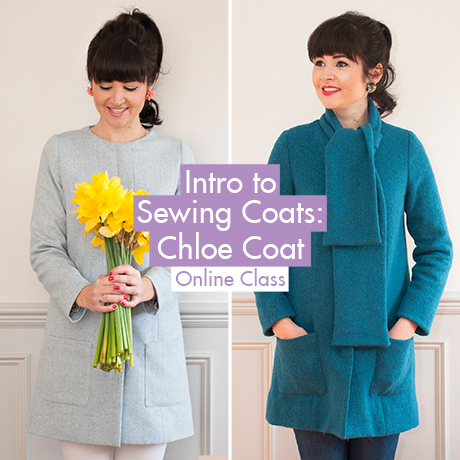 Intro to Sewing Coats is the online class for you! Our most requested pattern EVER, the Chloe Coat is a beautifully classic coat with simple details and an exquisite finish. With lined patch pockets, a pretty rounded neck and detachable scarf, it’s easy to wear, versatile and looks great with any outfit. For casual days pair Chloe with the Cowl Neck Top and Mia Jeans, or for a more dressy affair try her with a silk Ultimate Shift Dress or slinky Nancy. See what everyone has been making in the Chloe Coat gallery! The Intro to Sewing Coats: Chloe Coat online class is perfect for anyone after a step-by-step guide to sewing their first coat, but doesn’t have access to physical sewing classes. Sew as the mood takes you. Have a glass of wine at the same time if you like! The Intro to Sewing Coats: Chloe Coat online class is designed for coat-sewing newbies who want to take their skill level up a notch. A perfect course for intermediate sewers, you’ll get most out of the lessons if you’ve made a few garments before. You’ll need to have a good understanding of garment construction, and have inserted a sleeve and zip before. In this online sewing class, we’ll teach you all about how to sew a coat. From measuring yourself to choosing fabric to inserting the zip and adding your lining, we’ll go through how to sew your Chloe Coat in easy-to-digest, step-by-step stages. The video lessons are supported by written instructions and a series of helpful PDF guides. The Chloe Coat pattern is available in UK sizes 8-20. See the size chart for fabric and lining requirements. For inspiration and to find the perfect fabric, have a look at our specially curated suggestions.